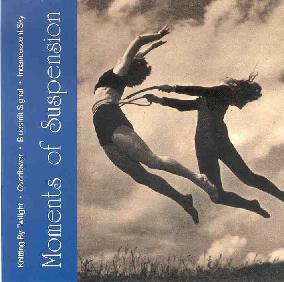 Various Artists - "Moments Of Suspension"
This compilation features seven well-crafted instrumentals that all share an affinity for the lighter, more airy side of electronic composition. Strains of new age and ambient, as well as contemporary classical music, can be heard in each of the artists represented. Blueshift Signal’s “Float” is clearly the stand out track, drifting along on a sparkling ocean of synthesizers before gliding off into sonorous realms that evoke images of flying through billowy extraterrestrial cloud decks. Incandescent Sky’s “Light House” has some elegant guitar/synth interplay that achieves an almost meditative effect. Dreamy and evanescent, the piece becalms the listener into a state of quiescence. Knitting By Twilight (who contribute no less than four pieces) are not particularly well represented here; the uninspired rhythm programming and lifeless arrangements make for some very non-descript film music. Not much information is given about the respective artists, though you can visit the label’s website for the requisite details. For more information you can visit the Moments Of Suspension web site at: http://www.overflower.com. Contact via snail mail c/o It's Twilight Time; PO Box 40112; Providence, RI 02940.